After the loss, Sean Couturier, who scored a hat trick, revealed he's been playing with a torn MCL. Pittsburgh Penguins center Jake Guentzel scores a goal against Philadelphia Flyers goaltender Michal Neuvirth during the third period. This felt inevitable. At least that was the underlying feeling that permeated the Wells Fargo Center on Sunday. The Flyers forgot to cover open players, forgot to protect the puck and forgot where the best hockey player on earth was in Game 6 of the best-of-seven first-round series against the archrival Pittsburgh Penguins. They also wasted a great performance from Sean Couturier, who, after scoring a hat trick in the game, revealed he was playing with a torn MCL in his right knee. The inevitability that the Flyers’ season was over seemed to rise with each passing second. Until, finally, it did arrive under a deluge of five-straight Pittsburgh goals in an ugly 8-5 Flyers’ loss in Game 6, dropping all three of their playoff games at the Wells Fargo Center, and consequently, losing the series, 4-2. There is one season that is ultimately successful – and we didn’t obviously accomplish that this year – but there were a lot of positives that we can go back and evaluate. It was a helter-skelter ending to a helter-skelter season. And it’s actually the Flyers who have themselves to blame for much of it. But the two-time defending Stanley Cup champion Penguins are the superior team. They’re faster, possess the best player in the game, Sidney Crosby, and have layers of postseason experience. However, it wasn’t anything the Penguins — playing without star Evgeni Malkin, out with a lower body injury — did to the Flyers more than it was what the Flyers did to themselves. 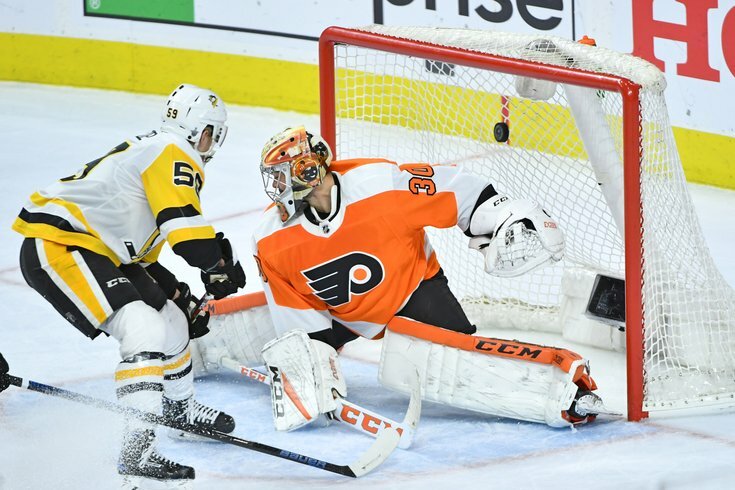 The recurring nightmares that will haunt the Flyers are of Valtteri Filppula losing track of the most dangerous player on the ice, Crosby, who whirled by Filppula as if he were standing still, to poke home a rebound for the Penguins’ first goal; or when Carl Hagelin was left alone in front of the net for the Penguins’ second goal; or the second-period goal by Patric Hornqvist, who came up the middle of the ice without being picked up by Travis Konecny or Brandon Manning; or Radko Gudas failing to clear the puck in the second, which resulted in Jake Guentzel tying the score, 4-4; or the injured Ivan Provorov turning the puck over to Guentzel, who scored his second, the go-ahead fifth goal, a mere 30 seconds into the third. The loss also wasted a superb performance by Couturier, who was forced to miss Game 4 after colliding with Gudas during practice, but returned to score the eventual game-winner in Game 5. On Sunday, the 25-year-old, playing with a torn ligament in his right knee, was even better, finishing with a hat trick and two assists in the loss. “On the 4-2 lead, things that came back to get us, and what caused us on the third and fourth goal, and some extenuating circumstances on the fifth, they’re a good team and if you make mistakes and give them the puck back too easily, they make you pay quickly,” Flyers’ coach Dave Hakstol said. “They did that to tie the game up at the end of the second period. A good (albeit misleading) omen came early, when Couturier scored off a rebound of a Wayne Simmonds miss with 17:45 left in the first period. Four minutes later, the Penguins struck back on a Crosby goal. Forty-seven seconds after that, Pittsburgh took a 2-1 lead when Hagelin was left alone in front of the net. It was a complete breakdown on the Flyers’ part, when Shayne Gostisbehere chased the puck in back of the net, then Nolan Patrick followed. Gostisbehere should have been protecting the slot. Instead, the Flyers paid with a 2-1 deficit. The topsy-turvy first period did end on a big positive, however. Not long after Andrew MacDonald tied the game, goaltender Michal Neuvirth splayed out and deflected a Conor Sheary shot with 2:30 remaining. The shot glanced off of Neuvirth’s left pad, hit the post and squirted free. And perhaps that momentum carried over into the second period, as the Flyers again wasted little time striking first. With just 40 seconds gone, it was Couturier again, putting the home team up, 3-2, when he scored his second using a nifty move on a shorthanded breakaway. With Patric Hornqvist draped all over him, Couturier somehow maneuvered the puck between the pads of Matt Murray, and it slid into the net to the surprise of everyone — perhaps even Couturier himself. Scott Laughton teamed with Couturier to put the Flyers up, 4-2, with 7:46 left in the second. But that’s when the onslaught began. The Penguins scored five-straight goals – Guentzel netted four and added an assist for good measure. And, suddenly, the deflated Flyers were making summer plans in their heads. During the series, Claude Giroux, Jake Voracek and Simmonds combined for a minus-8, which translates into little or no production from who are supposed to be among the top three veterans. It's hard to win like that. “We’ve always done things as a group. It’s never been about one or two guys. As a group, we could have played better in the series. Today, we could have done a better job and we had a real opportunity to push this to Game 7. A year ago, we spoke about being a team with depth and the ability to not look to one, or two, or three, or four players. Either way, the Flyers roller coaster of a season came to a screeching halt before a half-empty Wells Fargo Center. And while the fans couldn’t storm the castle with pitchforks and torches, they let their displeasure known by pelting the ice with bottles, t-shirts and hats in the last 31 seconds.